Now more than ever Sacha Baron Cohen seems to be looked to for cheap comedy rather than the once prestigious, if not still outrageous version of comedy that he was known for. This transition seems to have largely occurred due to two factors in that 1) Cohen became too famous to fool the commoner, politicians, or other celebrities into thinking his bits weren't bits and because 2) his targets haven't been as precise as they once were. Borat is now ten years old and I can remember sitting in a packed theater opening night and experiencing more consistent laughter than I have maybe ever during a theatrical experience (Step Brothers is a close second), but last night I sat with only my friend at a 10:00 pm showing in an empty theater to watch the latest from Cohen and whether it was the atmosphere (or lack thereof) or the fact the movie really is as lackluster as it seemed one truth remains evident: for someone who has seemingly come so far Cohen has regressed more than anything. 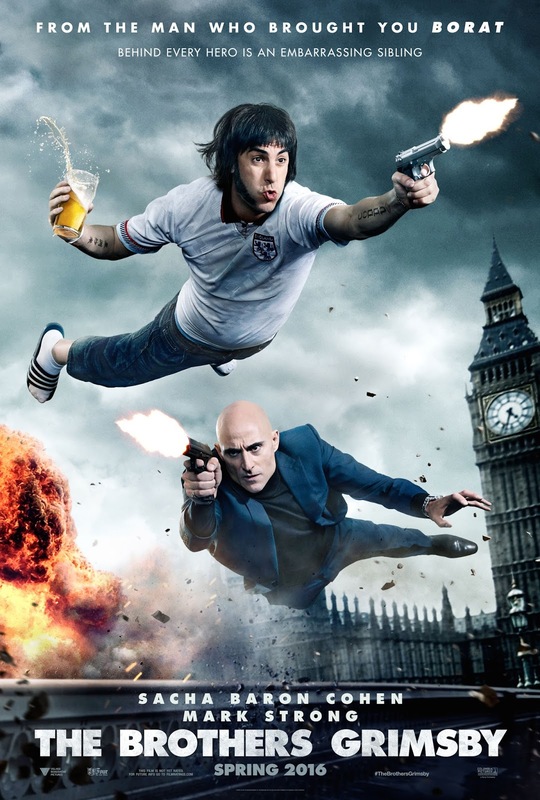 Sure, The Brothers Grimsby is a raunchy, over the top action comedy that pushes Cohen's comedy to even more ridiculous heights, but ultimately the film feels so slapdash and something of a mess that it is hard to take the jokes seriously. I realize that may sound contradictory, as in it doesn't make sense given that making jokes is the exact opposite of being serious, but what I mean to say is that there is hardly any substance left for Cohen to squander on his projects and rather than writing a story or coming up with a character in which the comedy naturally and inherently flows out of the comedian seems to have become more focused on coming up with gross out gags first and then going back to figuring out a story to work around them. I remain stern in my thought that Borat is one of the best comedies of the last twenty years (probably more than that even, but I won't test my limits) and hoped that Bruno was only something of a misstep, but while The Dictator was fine enough if not mostly forgettable The Brothers Grimsby once again skirts that line of being fine, but nothing special and nothing that will be remembered past this weekend no matter how ridiculous the stunts he pulls. Long lost brothers Sebastian (Mark Strong) and Nobby (Sacha Baron Cohen) finally re-unite with one another. Opening with R. Kelly's "Bump N' Grind" one can immediately guess the quality of humor they are going to receive in the film which then goes on to hit a punch line that has already been spoiled in the trailers. I'll admit, for a fair amount of time in the opening half hour of the film I was prepared to really dislike the film. Hate it even. I always have high hopes for anything Cohen sets his sights on as there is something exciting and strangely inviting about seeing just how much he can actually get away with, but as The Brothers Grimsby hurdles forward the editing is so patchy, the jokes so clunky, and the idea that Mark Strong would agree to this so odd that nothing about it seems to be working. It is once Cohen's Nobby and Strong's Sebastian get past the expository niceties necessary to set up the plot that things begin to gel and the pacing of the film actually finds a groove. The story goes something along the lines of brothers Nobby and Sebastian were once inseparable, growing up together in an orphanage in the town of Grimsby, England. When a nice, upper class couple wants to adopt only one of the brothers they are split up, Sebastian being taken in while Nobby left to toil away in the foster system. Forcing Nobby to spend the next twenty-eight years looking for his baby brother with little to no hope. Nobby remains in the seaport town that is Grimsby and becomes an English football supporter with nine children and the most attractive girlfriend in northern England (Rebel Wilson). In short, it's all a man from Grimsby could want. On the other side of the things, Sebastian has become MI6's top assassin who hasn't thought about his brother since the day he left Grimsby. It is through some unclear set of circumstances that Nobby finds out that Sebastian will be attending a "posh event" and somehow scores a ticket and so he sets off to reunite with his brother. Of course, not only does Nobby find his brother, but he also happens to uncover a plot that puts the world in danger. The two are inevitably forced to go on the run together with Sebastian realizing along the way the merit that family holds. At first glance it would seem there would be no redeeming qualities to this sparse, 83-minute comedy besides the fact that it only ran 83 minutes, but much to my surprise the thing that was most lacking in the early parts of the film came full circle to support the outlandish antics Cohen has put together. It isn't much, mind you-but there is something on Cohen's mind that he'd like to discuss and he explores it by pairing two different men from either side of the tracks in order to express just how much both need one another despite not wanting to admit such reliance. In short, there is this idea of population control that is brought up by philanthropist Rhonda George (Penelope Cruz) and how certain areas of the poorer population need to be extinguished due to their lack of contributions to the world. At the beginning of the film the character of Sebastian would have been hard-pressed to disagree with this point of view, but through getting to know his grown-up older brother and admiring the love he has for his (rather delinquent) children and crass wife it becomes clear to even him that there is value in what those unlike himself might bring to the worlds culture at large. It's an interesting stance for Cohen to take given one presumes his status is that of a rather wealthy one, but the comedian has always likened himself as something of a voice for the people and in that regard, The Brothers Grimsby is very much in line with his past work. Furthermore, there have to be those who slip through the cracks of societies expected ladder rungs otherwise we wouldn't have those who do the jobs nobody else wants to do. If this divide doesn't occur the likes of Sebastian and his girlfriend Jodie (Isla Fisher) have no one like Banu (Gabourey Sidibe) to clean their hotel rooms or Tabansi (Barkhad Abdi) to provide them heroin, and while The Brothers Grimsby wastes a rather strong supporting cast to make such observations the point is one that is still being made. There may be a lot of scum in this world, but you can't wash away all of it and worse is that if someone were to try, the existing systems would fail without such individuals. The backbone, after all. Nobby and Sebastian find themselves in some intense situations throughout The Brothers Grimsby. I don't want to act like The Brothers Grimsby is making some grand statement because it certainly isn't as more times than not we're balking at either just how much Cohen and his cohorts were able to get into an R-rating and/or that they were somehow still able to get Mark Strong do some of the things they have him do. Most of the time the film is vulgar to the point of no effect and the centerpiece of all this vulgarity (the scene Cohen brought to Jimmy Kimmel's studio audience that they couldn't televise) is shock for the sake of shock that bears no weight on the plot and plays no role within the intricacies of the story. There is an attempt to bring said sight gag back around for some type of justification during the films denouement, but it ends up feeling little more than stupid and desperate. As do the majority of the jokes in the film. While there is an especially funny segment where Cohen's Nobby accidentally stumbles into a spa without knowing he's in a spa the majority of these big set-ups can be seen coming from a mile away and thus render the jokes unfunny due to their obviousness. It is when Cohen allows the moment to breathe and will deliver a line with a certain cadence or put in a solid if not necessary jab at someone (here's looking at you, Daniel Radcliffe and Donald Trump) that the jokes land. Not to say too much, but there is something of a running joke where Nobby is compelled to do his best impression of Sean Connery as James Bond and it is in these lower-key moments of intended funny that Cohen actually comes across as humorous rather than someone who is trying so hard to make everyone laugh at him. Cohen enlisted director Louis Letterrier (The Incredible Hulk, Now You See Me) to give the film a sense of scope and authentic action while allowing himself the ability to do whatever he pleased when it came to the comedy and more than not the direction fulfills its duties. In the end, the film is short and concise enough to be entertaining and doesn't bother with anything resembling legit emotion or substance to actually bother or offend anyone who doesn't already know what to expect. And so, if you know what to expect you'll probably find something to like about it. I kind of did, but at the same time can acknowledge how terrible it is as well.